Under the drills, a joint Russian-Indian command will plan and carry out an anti-terrorist operation, involving the destruction of illegal armed formations. The composite tactical group of the 11th Air Assault Brigade (AAB), which is deployed near Ulan-Ude, is arriving in India on an Il-76 military transport aircraft to conduct joint exercises named Indra-2013. These manoeuvres will be held from on October 18-28 near the India-Pakistan border in the Thar Desert in Rajasthan. Russian troops will be using Indian military equipment, including the T-72 and BMP-2, about 30 units in total, all of them made ​​in Russia, says a Russian Defence Ministry source. The officer said a number of special features would be employed involved in this exercise. Russian soldiers and officers in the Indian units were previously involved in similar manoeuvres at the same location in 2005. Back then, the Russian troops in India were led by the current head of the presidential administration, Sergey Ivanov, who was minister of defence. At that time, special attention was paid to the manoeuvres, as combat training issues needed to be worked out, in terms of real threats from separatists. Joint anti-terrorist actions of military units of the two countries will be held against the background of India’s preparation to join the Shanghai Cooperation Organization (SCO). The Russian Foreign Minister Sergey Lavrov stated a few days ago that Russia would render all necessary support to India. This issue, as well as the problems of increasing military and technical cooperation, will be discussed at the Russian-Indian Summit, which is scheduled for the days when joint military exercises by two countries will be taking place in India. The Indra-2013 exercise and the participation of the 11th Air Assault Brigade, which is now subordinated to the headquarters of the Eastern Military District, are connected with attempts to solve the Russian military’s practical problems. Colonel General Vladimir Shamanov, Commander of Airborne Troops, stated that in this connection, this unit, as well as the other two air assault brigades that are in the district, will, in the near future, pass to the command of the headquarters of the Airborne Troops, in accordance with the decree of President Vladimir Putin. 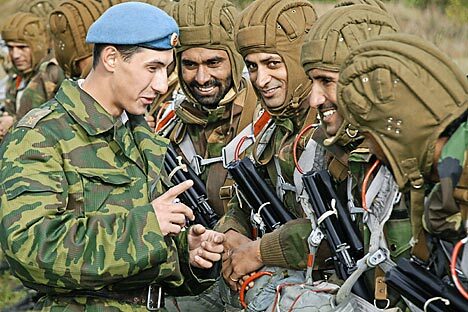 Shamanov did not specify how the defence of the state is connected to the training exercise of the Russian paratroopers in India. Although it is no secret that with the advent of the new leadership in the Defence Ministry, represented by Sergey Shoigu, mainly airborne troops will have to deal with combat and peacekeeping missions outside of Russia. Security Treaty Organization (CSTO). The position of deputy commander of airborne troops, responsible for peacekeeping forces and the CRRF, has been introduced in the headquarters of airborne troops. Major-General Alexander Vyaznikov has been recently appointed to this post. “India is a strategic partner for Russia on the Asian continent. With the withdrawal of international forces from Afghanistan, it becomes even more urgent to strengthen our alliance with Delhi,” said Colonel Eduard Rodyukov, corresponding member of the Academy of Military Sciences, to Nezavisimaya Gazeta. According to him, the military cooperation between the two countries is mutually beneficial. “I do not rule out that very soon Indian units will operate not only in bilateral military exercises with Russia, but also as part of the multinational forces under the banner of the SCO and the CSTO,” Rodyukov said.